Along with the pies, cakes, cookies and other delectable baked goods available in The Legend of Sleepy Hollow, meats such as slices of ham, smoked beef, broiled shad and roasted chickens are also described. The beef would’ve been smoked as a way of preserving in the 1790’s. Nowadays, thanks to refrigeration, smoked meat is more gourmet. You may find it in a speciality shop. If you’d like another type of preserved beef, slow-cooked corned beef, also known as silverside, is a nice and cost-effective alternative. It’s also handy as it can be served hot, or cooked earlier and served as cold slices. Shad is an oily and bony fish, also known as river herring. Shad was found in abundance in the Hudson River during Washington Irving’s time and easily caught during spring migration. As the whole reason for serving herring was because of its availability, we recommend that you use the same approach and select a more local fish. Not to mention that herring is an incredibly strong smelling fish, and for a party, might be slightly off-putting! Begin by preheating the oven to 325F/ 160C. prepare the bird by removing the innards, such as organs and the neck if it’s been left inside. Rinse the chicken inside and out with cold water, then rub salt inside and outside the chicken, letting the salted chicken sit for 10 minutes. Rinse again. Skewer the body closed (neck and rear) and tie the legs together with cotton twine. Wrap wing tips and drumstick ends with aluminium foil to keep from burning. Rub butter all over the chicken skin, sprinkle with salt, pepper and poultry seasoning. A two-pound chicken will take ~1.5 hours to cook. 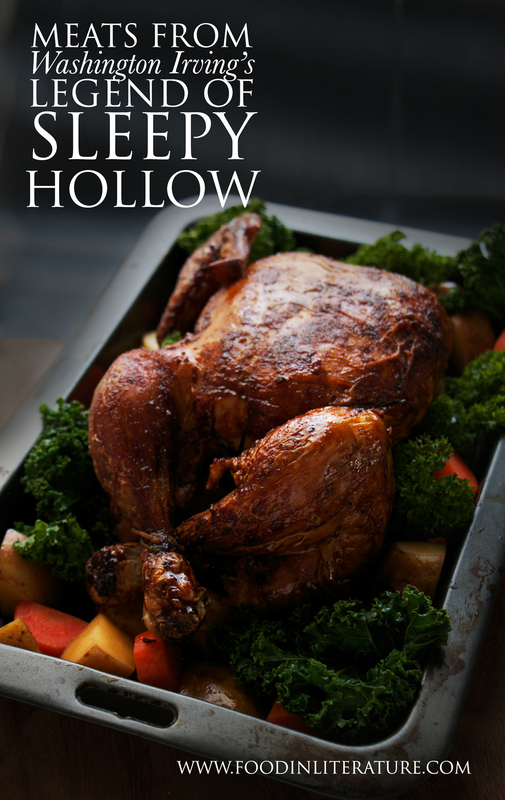 Visit the main Sleepy Hollow party page for links to all the recipes for Throwing a Legend of Sleepy Hollow Party.